I spent the last day of 2011 and the first day of 2012 in Berlin, Germany and while I was not able to sample currywurst I certainly did enjoy delicious German food. At night on NYE, during Silvester, in the push and pull of the crowds and the echoing of the music I found myself craving a brat and beer. I braved the lines of drunken revelers and managed (in rather rough German) to order myself a bratwurst with extra mustard and a cold Beck’s beer. Even though I could see my breath and barely feel my feet – a brat and beer has never tasted as good as it did that night! 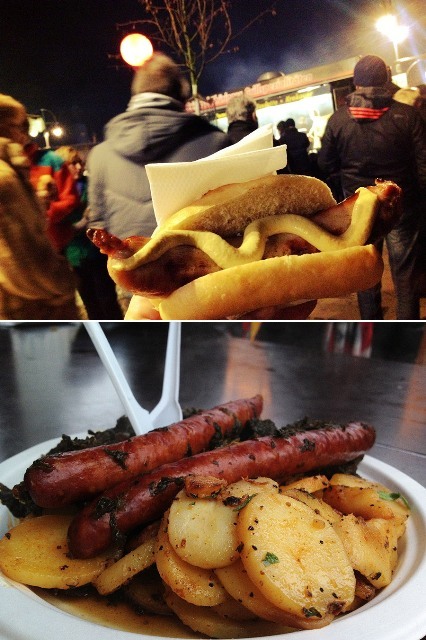 The next morning, on New Year’s Day, at a food stand in Potsdamer Platz I ordered sausage, pan friend potatoes and a kind of stewed vegetable that can only be described as a cross between Southern collard greens and sauerkraut. I wish I knew what the German name is for the meal I consumed but I know what it would be called in English: “yumgasm“. It also fortified me well for hours of picture taking on a gray, rainy day. My stomach was so happy, I didn’t even notice how wet I was!